Chartres Cathedral is one of the most important Gothic cathedrals with much deep alchemical symbolism woven into its structure. It is a mystical place where alchemists and pilgrims have come for thousands of years. Chartres cathedral is located in the small city of Chartres southwest of Paris in France. Today it is primarily visited for its divine stained glass. It is claimed the stained glass windows were conceived in a way that only benevolent rays of light would pass through as initiative chords to match the composition in stone of the structure of the cathedral. But the cathedral holds more secrets. One of it has been covered by chairs and has been out of use the biggest part of the past centuries. Presently, and after many requests, it is uncovered and open for visitors every Friday: the Labyrinth of Chartres. We walked up the aisle from the Central Portal between the rows of seats. and walked towards the centre of the cathedral. Suddenly I was stopped as if by some invisible screen. I was standing on the threshold of the Inner Sanctum of the Labyrinth! It was on Friday that Jesus walked to the cross. 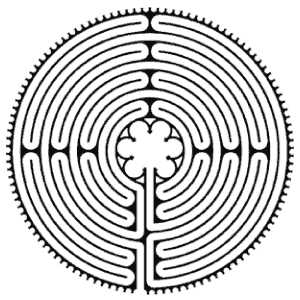 The Labyrinth is a symbol of the Via Crucis. Its length of 262 m is believed to be the distance Jesus walked from the Praetorium to Golgotha. Like other classical Christian Labyrinths, the maze is not meant to make you get lost but contains a single path to a final destination. Pilgrims used to traverse this labyrinth on their knees as a substitute for a pilgrimage to Jerusalem. It is a symbol of the converging Spiral of Life from birth on the outer circumference to death and rebirth in the centre... The six lobes of the central Rosette relate to Tiphareth and the six thought forms between which man has to become centered. Standing within the Rosette the outlines of the grey stone and the twists and turns of the maze become visible as if forming a cross. Thus the labyrinth signifies a journey of initiation through the elements in search of the eternal city. Not only must one encounter the elements but one must seek to master them; for while we are clothed in the flesh, we cannot leave the labyrinth. One must defend these elements so that one may find Jerusalem, the eternal city, the city of peace. The centre of the Labyrinth was designed to divide the seven bays of the nave in three and four bays. For the aspirant of the Western Mysteries the outer part of the maze relates to the 4=7 grade and the Garden of Eden after the Fall. Only by traversing the four quadrants of the Labyrinth, following the golden stone bordered by lead, will one reach the central Rosette. Access to the centre used to be forbidden for those that were not qualified. The reason for this is that the energies anchored within the Labyrinth are not suited for the unprepared. At the last step before one enters the Rosette, one may experience a blow of emptiness and pain as at this point a projected ray of energy is present, similar to that found on the deathbed of men. It is here that our old self dies. It will be left at the threshold upon entering the Rosette. There the worthy will be sanctified by a blissful beam of energy as strong as that found only at a Pharaoh’s Initiation Point like in the Temple of Man at Luxor. Walk the labyrinth barefoot, with the dedication of a pilgrim. Contemplate in advance which part of your personality you would wish to be grounded at the threshold. Other people may be walking the labyrinth, some faster and some slower. You are free to get out of the path for a moment to pass them if you want. Let it be a reminder that we are all on the path together, each in their own unique way. Take some extra time to kneel and pray once you have entered the Rosette. Try to tap in to the sanctifying energy of the Rosette. You may exit the Rosette anyway you like. You have symbolically freed yourself from the wilderness of twists and turns of earthly life, even of Time. You can therefore walk out as if the maze does not exist. There are many more secrets that can be discovered in this cathedral: What does the image with the four cherubs at the central portal portray? What is the deeper meaning of the image of the mystical tunic that is seen in various places within the cathedral? What is its relationship to the Black Madonna? Why is there a scorching and deadly ray of energy present in front of her? Was this meant to be? What lies in the yet inaccessible central crypt? Can you find the point of energy in the choir, above the converging subterranean streams, that was in front of the old location of the Altar? What relationship might Chartres have to the Ark of the Covenant? 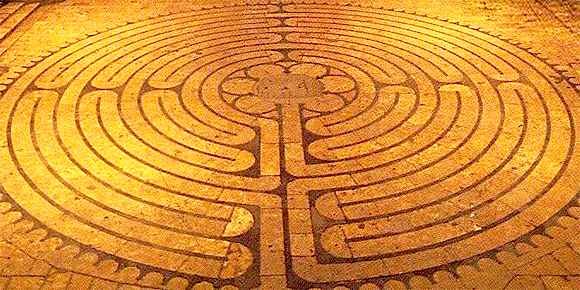 Walking the maze invokes the spirit of Christ and that of the Labyrinth into your life, and once it is traversed, you will never be the same again. Be not surprised if you will find yourself more than ever trapped in physical and spiritual mazes after walking the Labyrinth, because the Labyrinth will also make you aware of the work that needs to be done. Walking the maze is not going to make your life easier but it will show you that life is a-maze-ing.